Image courtesy of 05amam.org. Check their website for other excellent anti-sectarian ads from 2005. When some future historian writes a chronicle of 21st-century Lebanon, she will likely devote a bemused footnote to the odd events of February 2013, when the country’s leaders saw fit to tear down a pillar of the confessional regime one week, only to erect another one a week later. The long-term implications of such a development could be very interesting. Lebanon’s politics are based, in a fundamental way, on the parsing of the country’s population into discrete confessional communities. What happens when we begin to see people transgress the boundaries of these communities in greater numbers? What happens if, five years from today, there are 150,000 people who do not belong–administratively speaking–to an official sect? How would such people run for political office under the current system? How would they get divorced and bequeath property to their children? Speaking of their children, what is their own administrative status? Might all of these uncertainties end up providing a disincentive to remove one’s confessional ID altogether? Stepping back, is there a case to be made for creating a “19th sect” (i.e., the secular sect) that has representation in Parliament? Alternatively, would it not make more sense to start taking seriously the long deferred problems of the confessional system altogether? Not so fast, partner. Just a few days later, on February 19, the joint parliamentary committees tasked with formulating a draft electoral law for the upcoming parliamentary elections approved the much-maligned Orthodox Gathering Law, establishing another momentous precedent that will likely have serious repercussions on the future of Lebanon’s social contract. How to make sense of these contradictory developments? On the one hand, the country suddenly lurches forward toward a post-confessional Third Republic, in which citizens can marry whom they choose without submitting to the laws of the religious establishment. On the other hand, the most reactionary elements of the political class somehow manage to force through an electoral law that threatens to turn the rickety Lebanese model of confessional power-sharing into a system of unapologetic sectarian apartheid. It’s a pity to limit oneself to approaching the issue of civil marriage and electoral law reform through the lens of “sectarianism” and “deconfessionalisation”. These new developments in Lebanon have a much wider implications than what this lens would allow to observe. Doesn’t this approach stifle more important issues by locking up our reasoning in purely ideological terms? Please elaborate on your point. I haven’t followed Lebanese politics like I used to, so I am hardly in a position to analyze this law. Could it be that this law is championed for the sake of political autonomy for the various religious groups? So it was argued before that Lebanon is a federal state. Is this yet another step towards realizing that goal of political federalism? Who would lose out on that? The sunnis? They are against it, no? Makes sense, but maybe there is more to it than that. Didn’t Aoun say something akin to this law preserving christianity? Where? In Lebanon, or the ME? This law wouldn’t ‘preserve’ anything for anyone. It’s akin to enshrining sectarianism in Lebanon once and for all. “Political autonomy for the various religious groups” is one way of putting it. But that pretty much puts the nail in the coffin of any hopes and aspirations of a sense of Lebanese state. Already, most Lebanese are loyal to their “tribe” and sect first and foremost and the concept of “Lebanon” is about 10th on their list of loyalties. Now they’re being asked/told to stop caring about people from other sects entirely. Each sect will vote for its own representatives. Said representatives will, in theory, represent their coreligionists interests. Great. And who, pray tell, will represent the national interest of Lebanon as a whole? Who will be accountable and responsible for stirring the economy, social affairs, education, healthcare? Things that transcend sect and should apply on a national scale? Lebanon will continue being a loose grouping of sectarian “Cantons” (Use of that dreaded and often-maligned word, relic of the 1980s is intentional here), each managing their own (often at odds) affairs. The irony here is that the folks bringing you these laws are the very people who fought so hard against partition in the days of the civil war. It makes it even worse when the advocates of the law are pushing it down people’s throats in the name of a certain peoples’ rights. It was more of a desperate last attempt at restoring power rather than a thought out long term plan with the interest of the whole in mind. Well, national politics was never really a strong thing in Lebanon. But this law is for this one election, right? So in 2017 we can go back to talking of Lebanon as dysfunctional rather than severely dysfunctional. Hand on your hearts, do you really think a Lebanon drawn up by the French with all this mixture can ever function as a liberal-democratic nation-state? You think Syria ever will? Iraq? There seems to be a will to govern yourself, i.e. this law, but it stops short of actually proclaiming the one thing that hasn’t been tried politically yet – political autonomy. Or even your own state. In Europe we fought countless wars until the mantra one people – one state finally became a reality. Well, I’m sure we agree on this point. But I will elaborate on it: Resorting to the extremely politicised notion of ta2ifya (which translates as “confessionalism” in our political lingo or “sectarianism” for those who privilege a more derogatory translation) bridges two very different issues that deserve to be looked into separately. By linking them under that common heading, one is reframing these two issues in purely political terms. I do not mean by “political terms” the choice of a specific technical language that could have a heuristic value, but the use of terms used in the political discourse because of their emotional, ideological and “market” value. I believe it’s somewhat misleading to qualify the new interpretation given to Decree #60 LR as a “secularisation” of Lebanese matrimonial law. However, what it does is reinterpret marriage in purely contractual terms. And this goes FAR beyond “secularisation”. Never in our legal history have we had such a liberal approach to any kind of law. By doing so, we’ve not only covered the changes made in Europe and North America in the second half of the 20th century, but we’ve outrun them in the 21st century. As for the proposed change in the electoral law, I believe qualifying it as “sectarian” or “more sectarian” is little more than name calling. I find it more interesting to delve into the new dynamics it is likely to introduce (just as you do when you speak of the Take Back Parliament). I think that our discourse on confessionalism/sectarianism/communalism suffers greatly from the fact that issues covered by article 9 of our constitution (personal status issues) and those covered by article 95 (communal quotas, reserved seats and positions) are systematically linked. I do understand why politicians do it (they have a vested interest in doing so). But why should political observers/analysts follow suit? Especially when in a situation like last week both articles were somewhat reinterpreted through very different dynamics and for very different purposes. You speak of “tribe”, “coreligionists interests”, “sect”, “cantons”, “partition”. This terminology clearly shows where your fears are rooted. But are these fears really grounded? I’m not so sure. 1. The current political configuration of our political institutions. They are dominated by groups that claim to represent their communities and their communties’ interests. This is true for the dominant muslim-based patronage networks or the Big Four (Hezbollah, Amal, Mustaqbal & PSP), and the minor christian-based patronage networks (those headed by Aoun, Geagea, Gemayel, Frangieh, Murr, Skaff, Pakradounian…). This trend has gone so far that even the Prime Minister and the President of the Republic have one several occasions put forward the fact that they “represent” their communities! How will the “orthodox proposal” affect the fact that our political class claims to represent communities and communal interests? Will it “entrench” it, “undermine” it or modify it? One cannot answer this question on normative grounds. One thing is for sure, when all MPs have been brought into parliament by their respective communities, none of them would be able to claim more than another to represent his/her community. So that wouldn’t be an issue any longer, would it? – Voters’ aspirations and views. Are Lebanese voters’ choices determined by “the inherent feelings of insecurity and mutual-distrust felt amongst Lebanon’s sectarian groupings” (as Zak Brophy in yet another alarmist “analysis” put it). I personally don’t think so. The worst thing about all “analyses” related to this law is their elitist stance and their general disdain/fear/contempt of the Lebanese voters’ choice. Are voters’ views determined by a specific electoral law? Are they all grounded on “sectarian” believes? I very much doubt that. My fears? This has nothing to do with my fears. I am an expat who has long lived outside of Lebanon and has no interest of returning. There is no fear here. I promise you. I read your comments with interest, and found myself returning to a certain premise where I think you and I are on different wavelengths: You seem more interested in the impact this law (or any electoral law) may or may not have on the dynamics in parliament, in society, in the day to day affairs of the Lebanese. And while that is one certainly valid way of looking at it, it remains within the confines of the “politics game” (ie what side this or that law benefits, who has more power, less power, etc.) All interesting topics, but not ones I am all that interested in, personally (although it may be of interest to others). I am interested in promoting what is fair and just (and I know full well that I’m setting myself up here for the criticism of who decides what is fair and just). In short, I’m interested in doing “what’s right” (as nebulous as that may sound), no matter who it empowers, or what dynamics it puts in play among the current political elites. My opinion of “what’s right” is based on some simple rules: human rights, equal opportunity and treatment for all, a just set of laws, applied to all. In short, what passes, for the most part for “what’s right” in the modern civilized world. While “what’s right” may be somewhat subjective, I think we’d all agree that some things are inherently and universally agreed on as being “bad”: Slavery, discrimination, persecution, genocide, apartheid, war, crime, torture, lack of human rights, etc. (If you disagree, you may as well stop reading here). Based on this premise, I deem that sectarianism, as a whole is “bad”. ANY law they may come up with that does not respect the concepts of “one man, one vote” is “bad”. Some possible laws are worse than others. The orthodox law, as it is dubbed, seems to me like a step in the wrong direction. When I think about it, the words that come to mind are not “just”, “fair”, “better representation”. The words that come to mind are “apartheid”, “segregationist” and a slew of other “bad” words with “bad” connotations. I am not interested in whether this or that law benefits the Christian community, or empowers the Shia, or the Sunnis. I am not interested in a state where some citizens have different rights than I do, be it because of the color of their skin, their sect, or their gender. I am not interested in a country where women do not have the same rights as men. Where their votes count differently (while we’re at it, why not have women vote for their own representatives in parliament too? And why not gays and atheists?). I am not interested in a country where nobody is ever held accountable for failing completely at running the economy, or education or providing healthcare to the people. I am not interested in a country where I am not allowed to hold this or that office due to my father’s father’s sect (since neither myself nor my father have ever practiced any religion). I am not interested in my community being identified based on sect. My community are my friends, my neighbors. We should all follow the same rules. 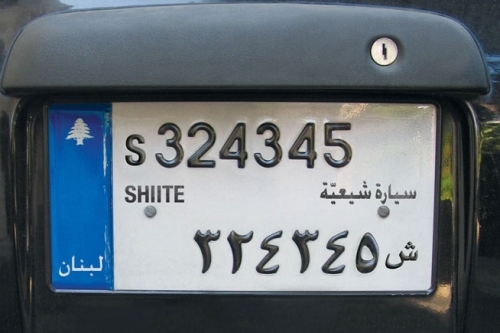 In my Lebanon, the people would identify with their nation first and foremost. They wouldn’t care that a Christian is president, or a Shiite is president. Let us have a popular vote for president. Let every man, whatever sect, color, gender or sexual orientation have an equal vote. And let the candidates be of whatever gender, sect and creed. Let us elect our local respresentatives based on their physical and geographical location. I want my mayor, my city councilman and my representative in parliament to be folks who live where I live, and who’s job is to address the local issues for the area they represent, not the sect they represent, with no geographical tie to anything i’m interested in (Why should I vote for a Sunni in Akkar, just because I’m sunni and he’s the only guy I’m allowed to vote for? I have no interest in Akkar. If I live in Beirut, I want to be able to vote for the Shiite or Christian who lives in my building, who knows my issues with the potholes down the street). Having some guy from 100km away represent me in parliament simply because him and I share a word “Sunni” on a card (even though neither one of us may ever attend a mosque) is the most ridiculous notion of “representation” that I may have ever heard. Sorry for the rant. I can get somewhat passionate about all this. But I’ll repeat: The way this law or that law will impact the dynamics in parliament is WAY low on my list of interests here. This law is, hands down, the best thing Lebanon could have hoped for at this point in time. All this talk about sectarianism is more than a little ridiculous: as if the current system has made such great strides defeating sectarian sentiment in recent years, and this new law was designed to stop this process. This Orthodox will create space inside the sect to allow for a plurality of voter lists, each of which can build bridges with philosophically allied movements within other sects, free of the burden of having to constantly prove that it is the most ruthless in advancing the interests of the sect. Just about the only victims of this law will be the sectarian politicians who rely on fear and xenophobia to police their own constituencies. When the interests of the sect are guaranteed by law, the siege-mentality campaign strategy which some Lebanese faction rely on to ensure that a plurality of their co-sectarians turn out to defend their designated sectarian cantons from the existential danger of minority sect voters will become moot. The other victims of this law will be rural voters, which will be spurned by just about all candidates regardless of party or sect, since larger cities will by definition offer a voter densities that will be hard to compete with. Michel Aoun & Samir Geagea now seem to agree that Lebanon is as Maronite as Palestine is Jewish or Palestinian or whichever way gets them to a Presidency and to a life forwards in this world. FM should agree to this and let Aoun start fretting. Future will never agree to single-district PR, for the simple reason that they will lose seats to Hizbullah. A single district will make it possible for HA/Amal to pick up a few stray Sunni seats here and there, while the FM just might pick up a Shiite seat. The FM people I’ve spoken to (including a couple advisors in Hariri’s inner circle) tell me that they figure they could lose up to 10 seats under such a scheme. That could be true, but couldn’t it also be true that FM will gain seats at the expense of the Christians? So net loss would not be as large as 10 seats. Without a census, no one knows. It could also be that the total of seats that M8 has will stay about the same because FPM will receive less seats. What FM should do, is perform a scientific mini-census focused on likely voters. I would not give up on this so quickly because even if they do end up losing a few seats, by supporting this Nasrallah initiative they may be able to cause a “civil war” in M8 and fracture that block. Why are Lebanese inhabiting Syrian Villages? Do Syrians inhabiting Lebanese villages have the right to take up arms against the Lebanese should they find themselves under attack? The truth is that non-religious, educated, and secular people in Lebanon are minorities. This law is the best given that 90% of Lebanese voting choice is based on Religion. Until the day come when we become secular, this law is the best ! This law is the only hope to change the way we think and behave. People will change when “religious survival instinct” is out of the equation.